Invite someone over on a sunny after noon to play a game of checkers outdoors and present this project you made yourself. 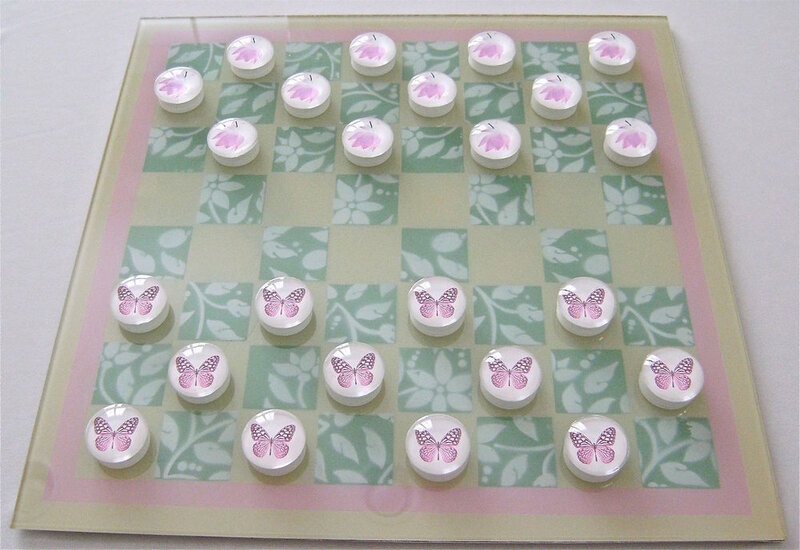 Pieces topped with butterflies and flowers create a relaxing atmosphere, one where aggressive game-playing is out of place. The design suggests a friendly, lazy game. The pieces and board are made of glass. Images are glued to the 24 game pieces while the board is painted on the underside of the glass. Have fun making this project AND playing with it! step 1 - Print out 4 copies of the checkerboard template on card stock. The template represents one quarter of the finished board. step 2 - Tape the copies together allowing a one-inch border on the four outer edges. The thin black lines indicate the edges of the playing board area. Once taped together, the playing area should measure 12” square. The complete card stock template should measure 14” square. With a craft knife and ruler, cut out all the black squares. step 3 - Spray the back of the completed template with spray adhesive. step 4 - Clean the front and back of the glass. step 5 - Place a strip of half-inch masking tape along the edges of the glass on all four sides, aligning the edge of the tape with the outer edge of the glass. step 6 - Apply another strip of tape inside the first strip on all four sides. The two tapes should be touching. This will leave a 12” square of uncovered glass in the center. step 7 - Create a 12-inch square from card stock. Spray only the outer edges on one side with adhesive spray. To minimize the transfer of adhesive to the glass yet still allow it to adhere, press the sprayed areas on the surface of an old tee shirt then remove. Do this two or three times then stick the card stock to the open glass. step 8 - Remove the second line of masking tape you applied to the glass which will expose a ½” margin between the card stock and the masked outer edge. Spray the open area pink to create the perimeter of the playing area. step 9 - Spray adhesive onto the entire back of the board template. Treat the board template as you did the card stock in step 7, pressing it onto fabric then applying it to the glass. Be sure that the edges of the template and the glass are aligned. 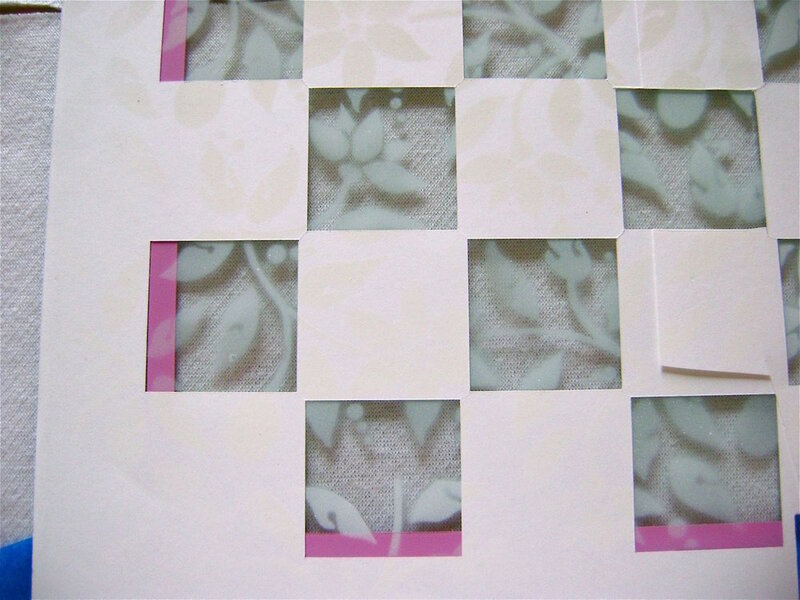 The pink border will be visible in some squares. step 10 - Spray the leaf stencil with adhesive and position it on top of the board template. The stencil is not large enough to cover the entire board so it will have to be worked in sections. step 11 - Place the stencil over open squares and spray the glass with white paint. When all the painted leaves are dry put aside the leaf stencil. step 12 - Paint over the leaf designs with green paint. step 13 - When the paint is dry, carefully remove the template stencil. step 14 - Spray the entire surface with the tan paint. Allow the paint to set for 48 hours. step 15 - Cut a piece of mat board to measure 14 x 14.
step 16 - Pour some Diamond Glaze in a small bowl. With a 1” wide soft brush apply a generous amount of the glaze to the wrong side of the mat board. step 17 - Position the board against the painted side of the glass. Let it dry overnight with the glass side facing up. Finish by attaching clear, self-stick bumper pads to each corner of the board. step 18 - Print out the checkers images on a laser printer. You can get this done at Kinko’s if you don’t own a laser printer. Images printed on an inkjet printer don’t work well because they bleed when they come in contact with the Decoupage. step 19 - Cut out the round printed images. Brush the flat side of a round glass piece with Decoupage. Immediately apply the image to the flat side of the glass. step 20 - Brush the flat side of a plastic water bottle cap with Dazzle-Tac and attach it to the blank side of the card stock. Dazzle-Tac won’t darken the card stock like some adhesives. Allow the checker pieces to dry completely before handling.